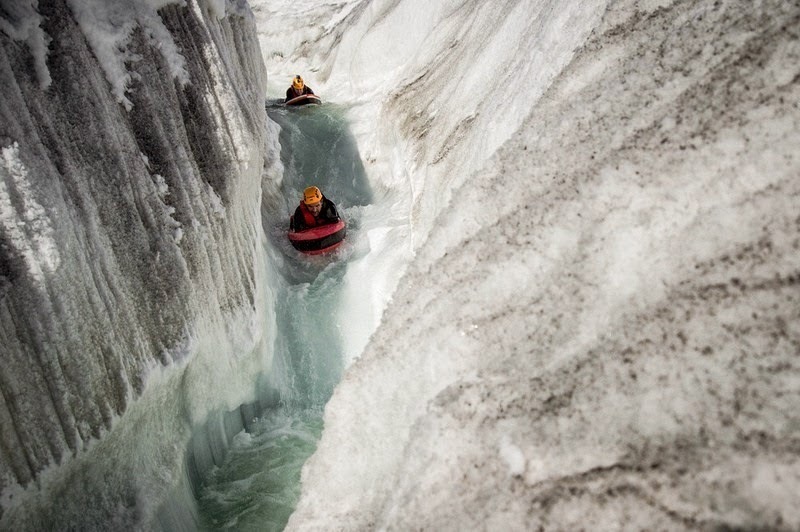 As glaciers melt they form little rivulets which join into bigger streams and some time end up falling into a hole and flows under the glacier. 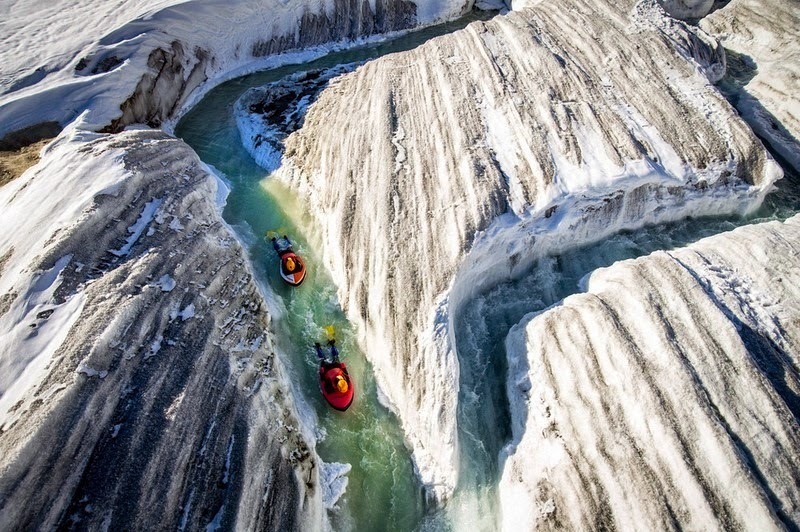 Hydrospeeding is simple, just walk up the glacier carrying your tiny… well it can hardly be called a boat. Maybe personal floatation device… without falling to your death in a crevasse. although the warmth might be welcome at that point. I don’t want to sound negative or judgmental, but… can’t you fools find something warmer to do? It would be terrifying to just pick one at random and wind up going down a waterfall into a hole, but if you scouted the route out and were sure where it wound up, I bet it would be a blast. 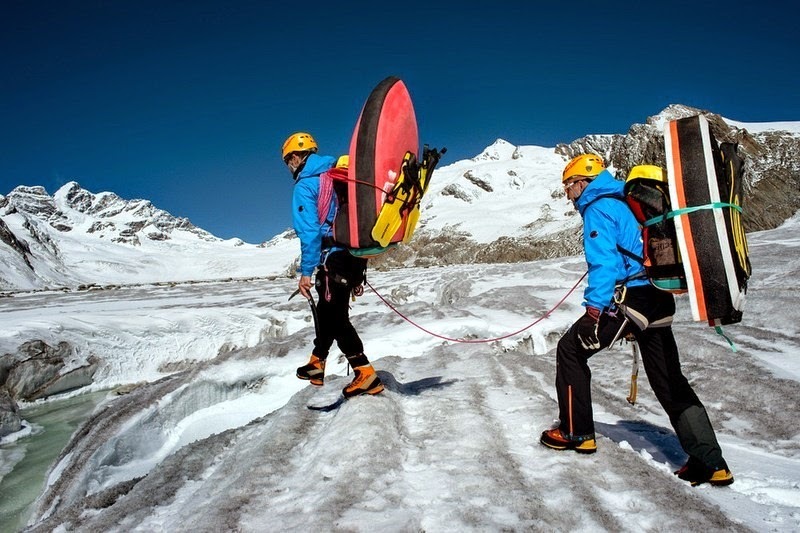 Wondering about rescue arrangements when the extreme sports folks end up in deep crevasses or crushed by large ice and debris. It sounds like disaster is rather likely. None, like skydivers they're on their own. "Hey, Joe, these wake board things are fun, but, how can we make them more deadly?" Lying on a half-boat, while your privates are submerged in near-freezing water all day, will ensure that your genes won't get passed down to the next generation. We thank you for that. "...underneath the ice and Steffen reckons there is a good chance they have been ground to a smithereens by the huge mass of ice." Just how hard can I say fuuuuck no!? ?